Oh, this is a pretty little thing... it measures just 1-3/4 inches in diameter, and if you look closely... it looks like 6 hearts all joined together. You can wrap threads all around the outside of this, OR you can loop threads around each of the heart tops. Whatever floats your boat! We LOVE these! Every needlework tote bag needs one, and so does your purse. 5-1/2 x 6 Microfiber cleans magnifying and eyeglass lenses beautifully -- even your phone and e-screens! They come in a 2-1/2 x 4 clear plastic storage envelope -- perfect to keep it protected. Images of old needlework... the scissor and pin cushion design is a stitched image in deep red shades. The sampler ones features images of antiques stitched in 1824 and 1827. These are fun and functional -- keep them around to clean the lens of your magnifier. Wow, this is a petite and functional storage system for teeny tiny stuff!!!! 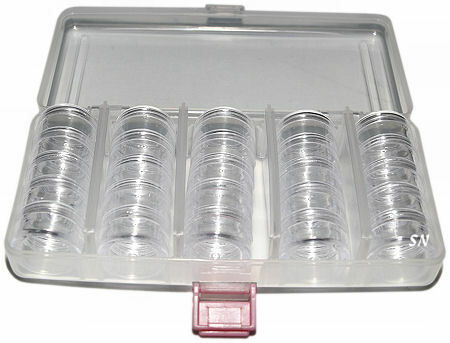 Our 6 x 3-1/2 x 1-1/2 inch snapping closure box holds 25 different treats. Clear, so you can see what's inside, open to reveal removable dividers that separate 5 towers of screw-top jars. Each mini-jar is approx 1 inch round and 1/2 an inch high. They screw together -- so the lid on one becomes the bottom of the next. VERY secure, and also clear so you can see what's inside... these even work for wet creams and lotions in your cosmetic travel bag! Everything is safe, organized, and compact! The little box weighs about 8 ounches. How cute are these????! We have *The Classic Tomato Pin Cushion* re-dressed with embroidery scissors on its fabric, Pink & Black Paris fabric, Taupe and Creme Parisian Couture hand sketches (I love that one! ), or the classic red, navy and black of London's vintage telephone booths, Metro stations, and British flag! 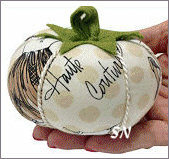 Each stuffed tomato cushion measures approx 3 inches in diameter and is two inches high. There is a little green felt loop on top. along with the 'greens.' Tufted into six sections -- each comes packaged in a clear gift box, and is BEGGING to be useful and poked with your pins and needles! 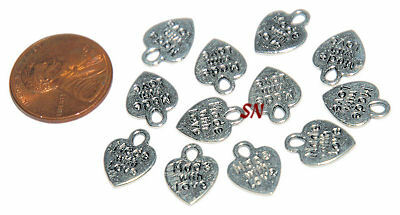 I found some neat little 3/8 inch heart-shaped charms that say *Made With Love* on both sides! Nothing elegant, they are cool, however, because you can attach one to absolutely every thing you stitch... sometimes beside your signature or initials, sometimes... just an added trinket appearing someplace unexpected. Tiny, shiny dressings to accent the fact that you've hand-made something special -- complete with love -- I thought they were kind of fun! Packed in bags of 12 silver-toned charms, they're only $3.95 a bag... but they look like a million bucks on your finished creations! These are super-simple but SUPER needle organizers! 1-1/4 wide x 3 long x 3/8 of an inch high, these are plastic boxes with white magnetic material lining the bottom. You can see through the lid to know what's inside. The magnetic bottom holds your needles in place along with any metal needle threaders you put in them. Here's the cool part... you can LABEL these as to size of needle!!!!! They're small and only $2.95 each... so get a box for each needle size and you CAN TELL WHAT YOU HAVE!!!! Small enough for sewing cases, lightweight for stitching totes, I like that I can SEE what's inside and I can LABEL it if I want! 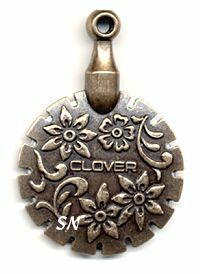 Do You Have A Clover Yet? This is the coolest little gadget by the Clover Company! 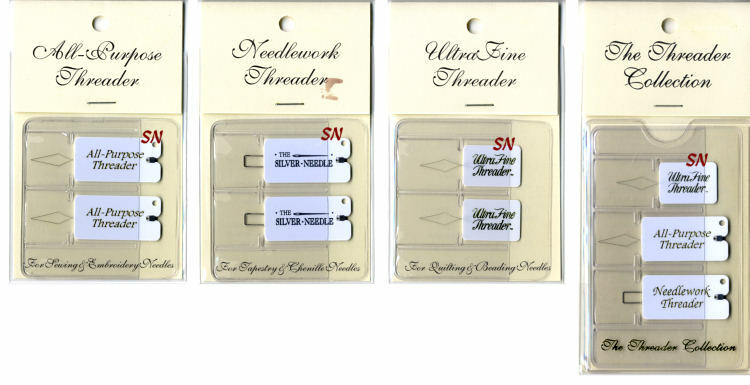 Choose from an antiqued gold or antiqued silver thread cutter that feels heavy for its teeny size! Look closely, there is a recessed, protected razor blade -- circular -- inside, and lots of slits around the edges to insert your thread and cut! No scissors!!!!! It's decorated with flowers on both sides and there is even a loop at the top to attach to a chain or to tie onto something. Just perfect for travelling! Every stitcher's Christmas stocking needs one, as well as every stitching bag in America!!! This is handy gadget, that helps you anchor short threads. Simply insert the long wire through the back of stitches, catch the too-short ends and pull them through! Great as a small needle threader, too! The star on the end is opalescent plastic, and has a tiny loop so you can attach it to something for safe keeping. Hey, these are cool little things!!! A wonderful way to display finished needlework... these are clear, acrylic stands that simply insert up into the bottom of your flat piece of stitchery, and hold it in place for display!!! Two sizes available, each an inch wide, the smaller one measures 2-1/4 inches high, and the larger is 4-1/4 inches. Designed to hold up small, lighter-weight pieces... our pics show the Lizzie Kate Spring Basket Snippet, finished into a flat, square piece -- complete with pretty fabric back, a little padded batting inside, and a twisted cord edge treatment. If your piece is larger, you may want to try two stands for extra stability! Seemingly a little pricy... these are really a great alternative to bulky or expensive framing finishing... and they're re-useable!!! So... actually a great value, after all!!! 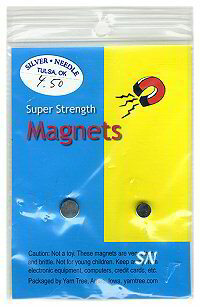 What a cute little set of turbo-magnets! 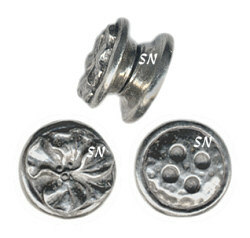 Decorated with a pewter button design on one side, and a flower on the other, you can use them to hold needles onto your fabric, or the chart onto your magnetic board... or even to decorate your kitchen refrigerator! They measure a petite 1/2 in diameter, and come as a pair. They match all our pewter Tail Catchers and Laying tools, as well. This is a very cool little gadget... it helps you grab at short ends to tuck them safely away, and features a pretty needle threader. Joined by a detachable chain, notice the threader end... tuck it under threads. Then, use the hook to grab errant threads to tuck into that threader... and pull the thread to safety! Don't know if my description makes sense... but I bet you can tell from the pic the features of this pretty accessory! It matches our Stitch Removers and Laying Tools... and those new little magnets! 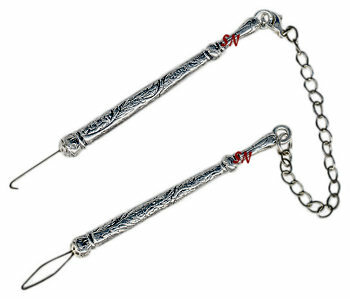 These are pretty pewter tools that features a floral design on its handle, and a seam-ripper head. Measuring a mere 3-inches (or 4 1/2" for the Elizabethan one) in overall length, they offer an easy way to tear out errant stitches, and look quite classy in the process! They come with a protective metal tip-cover for that little ripper, so they're protected for years and years... of hopefully occasional use!!! These look like all laying tools we carry (see below)... very nice! Here's a pretty little gadget for the stitcher who has everything else!!! It's a laying tool with a beautiful filagree collar that snuggles around your finger. Because the pewter is a soft metal, when you warm it against your skin, you'll be able to bend it a little to custom fit your finger! It feels wonderful, looks fabulous, and works like a dream, all while organizing your threads neatly while you stitch with them... it' sooooo cool! Additional styles of pewter laying tools, designed to help make your threads lay smoother when you stitch, each has a pretty pewter handle, and a stainless 'blade' to slip under your stitches. The top tool in the pic features a very pointed end, along with a tiny cover for protection. 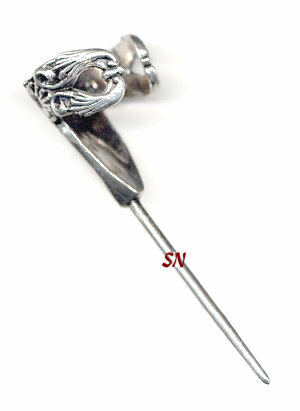 The bottom tool features a blunt end, for larger needlework and threads. So pretty and functional, but probably not something for an airline trip!!! These are the handiest things! 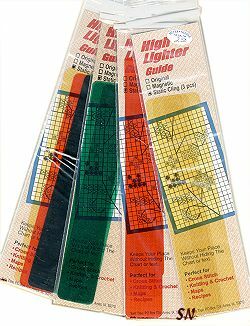 Colored, clear plastic 1 x 6-inch strips cling to your chart paper using static electricity. Perfect for keeping your place, yet being able to see what's coming in the next few rows... they weigh nothing, and take no space in your totebag. They work great when you're doing data entry in your computer, a help when you're reading, just so many things! I've even trimmed some of mine smaller, and tucked them into my Needlesafe! Available in yellow, orange or green -- three strips per package, there is an assortment package of one sheet in all three colors, if you can't decide which you'll like the best. Just the handiest little gizmo! Your bead kits come with needles, but how about a few more??? These are our favorites... they feature a point, but supposedly have a ball point tip (like an ink pen.) I say supposedly, because I cannot SEE that small to verify that tip! But they work beautifully and fit the beads! Package of 6 by John James. A great all-around needle threader... these will thread Tapestry needles as well as many others. The durable design features a wire that is fused into the plastic housing, along with a recessed cutting blade on the opposite end! There is even a small hole provided in case you want to attach it to a favorite chatelaine or project! Ours are packaged in pairs in a protective plastic sleeve and case. Very handy! The heavy-duty version of our other two threaders, this one is perfect for Tapestry and Chenille needles. Used for needlepoint, cross-stitch, hardanger and embroidery, it's perfect for perle cottons, yarn, ribbons and specialty threads (like some of the heavier Rainbow Gallery ones!). The square design of the threader allows the thread to 'spread out' as it passes through the eye of the needle, so there is much less stress, (and less breakage later on!) It features a recessed cutting blade, as well as a hole for attachment to a chatelaine or sewing case. Packaged by the pair in a wonderful clear plastic protective sleeve... they slip into a clear case for extra protection. 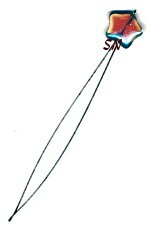 A trio of needle threaders, each with a specific use. Specially packaged for The Silver Needle in a handy, clear storage sleeve. $6.75 pkg. 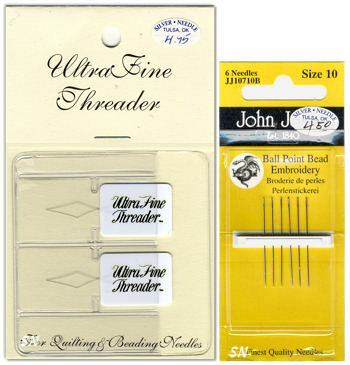 Ultra-Fine: for quilting and beading needles. All Purpose: a good general use threader with a built-in cutter. Heavy-Duty Threader: for larger threads and delicate fibers, too. Also has a built-in cutter. 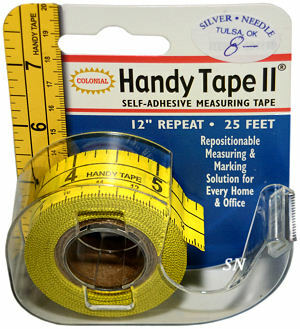 This is totally fun heavy yellow measuring tape! It is re-positionable, it repeats every 12 inches, and the roll has 25 feet on it. Actually, it's pretty handy to tape to the table when you are cutting multiple lengths of something like ribbon, or pieces of fabric... and pretty cool to use for children's crafts! Here's something that's incredibly handy no matter what fabric you're stitching on... it helps you figure finished design sizes and lets you compare that finished size on various counts of fabrics -- before you begin the project! Remember the old Cross Stitch Rulers from 15 years ago??? This is the same thing, with 'rabies!' Instead of fabric count gauges for only 4 fabric counts...this little gizmo features 12 counts!!! 11, 14, 16, 18, 22, 25, 26, 28 30, 32, 36 and 40! You take that stitch count from your chart... and look it up on the various rulers... and immediately SEE how big the project will finish on whatever sizes of linen or aida you care about! People are always asking well... how big will it be on 32 or how big will it be on 18... this SHOWS you! A very good value (cheap! ), and functional.. every totebag needs one of these!! !